Yesterday (22 April) staff and students - organised by the Joint Trade Unions representing FE workers - in Welsh Colleges took part in protests against Welsh Government cuts to Further Education. 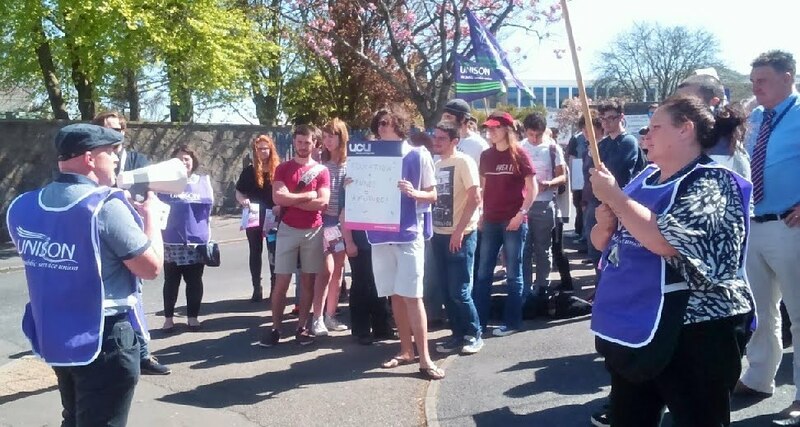 Early reports are that the events were well supported all across Wales, which fits with my experience in Gower College Swansea. 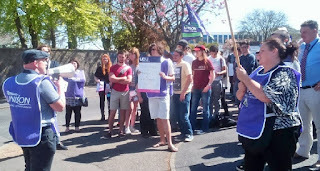 At Gorseinon, where I work, the joint trade unions put out a call for people to gather at 1pm at the main gate and workers and students responded enthusiastically. There was an upbeat atmosphere but a quiet determination to stand up for the broad range of quality learning and training opportunities we provide, particularly for adult education, which is seeing a 50% cut in funding in a single year! The range of chances for adult learners in our communities, that colleges provide, will be seriously reduced if these cuts go through and where learners can find courses they could be much more expensive as colleges have to pass on the full cost price to learners. This is likely to price many out of education and training. 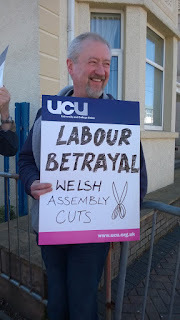 Has the Welsh Government abandoned the principle of 'lifelong learning' in its willingness to pass on Con-Dem cuts? 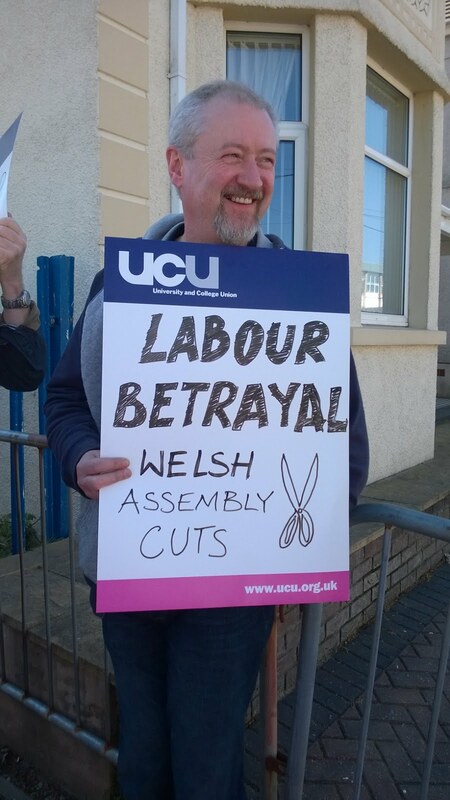 Workers and students were clear what they think of Welsh Labour cuts to Further Education, summed up in the placard made by one lecturer - betrayal! 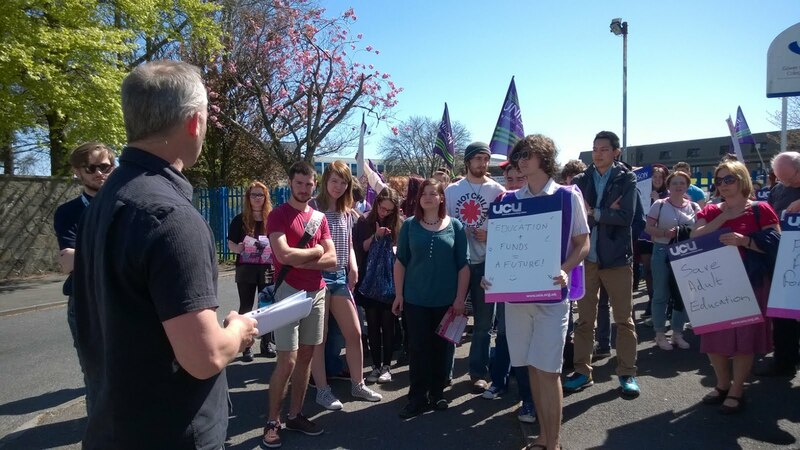 Next Wednesday (29 April) we take our protests to the Welsh Government's doorstep as we demand they reconsider and give us the resources we need to deliver the high quality education we're proud of. TUSC, as the only 100% anti-austerity party contesting the election on May 7th stands shoulder to shoulder with all those standing up for Further Education.